You could call this sweet pup's story a New Year's miracle. 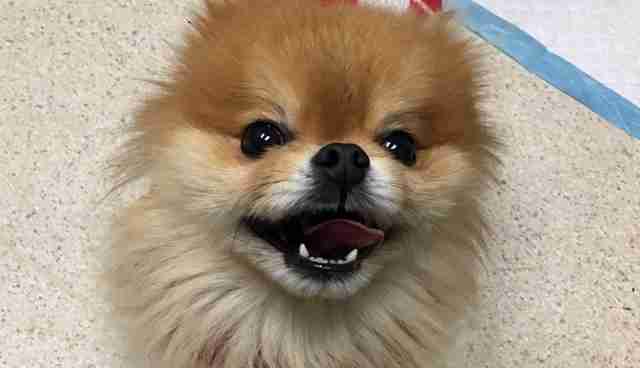 Harrison the 4-year-old Pomeranian was surrendered by his previous family - who left the country - to the Sacramento Society for the Prevention of Cruelty to Animals (SPCA) in California the day after Christmas, according to The Sacramento Bee. Courtesy of the Sacramento SPCA. Harrison has a skin condition, called alopecia, that causes hair loss and is commonly found in Pomeranians. He also has one deformed ear that is much smaller than the other due to a healed hematoma. Of course, that didn't stop Sarah Varanini, an SSPCA staff member, from pulling out all the stops to make certain Harrison would find a new home where he'd fit right in. That's when Varanini reached out to Bravo reality TV star Lisa Vanderpump of "Vanderpump Rules." Vanderpump owns another Pomeranian named Giggy, who also has alopecia. Varanini contacted Vanderpump through Facebook and Twitter to see if she would be willing to take Harrison in. As it turns out, it was love at first sight for Vanderpump. @SacramentoSPCA i will take him...can you contact me. The reality star met up with Harrison and members of the SSPCA in Kingsburg, a small California town just 2 and a half hours away from Sacramento and 3 hours away from Los Angeles. Vanderpump had questions about Harrison's diet and health, but never hesitated to take him home, Lesley Kirrene, SSPCA spokeswoman, told The Sacramento Bee. And just like that, Harrison (nicknamed Prince Harry by Vanderpump) went from rags to riches. It's incredibly touching to see Harrison adjust so well to a life of luxury. He definitely deserved this happily ever after.Learn how you can adopt your own little rockstar here.